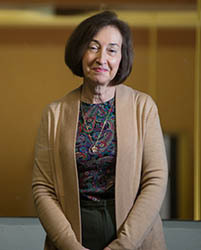 Helen Fallon, professor of journalism and director of Point Park's Honors Program, has taught and served as an administrator at Point Park University since 1986. She was chair of the Department of Journalism and Mass Communication from 1999 to 2008 and was the acting dean of the School of Communication from 2008 to 2009. She then became director of the Honors Program. Under Fallon's leadership, the School of Communication began annual student trips to Washington, D.C., and a different foreign country each year to focus on national and international media as well as broaden travel experiences for students. Past trips have included Germany, Paris, Italy, London, Toronto, Dublin and Prague. Fallon remains an active journalist, working every Friday as a copy editor for the Pittsburgh Post-Gazette, where she's been gathering real-world materials for her classes since 1990. Earlier in her career, Fallon worked as a reporter, copy editor and editor for several papers in the Pittsburgh area for six years, and did public relations for a university and a community hospital for five years. Fallon is involved in journalism education beyond Point Park, working with high school students by teaching apprenticeships for the Allegheny Intermediate Unit's gifted and talented program and visiting area high schools to talk with journalism and communication classes. She has been an active member and leader in the Pennsylvania School Press Association and has made presentations with the Journalism Education Association at its national conferences as well. Fallon and her family, daughter Amy and son Stephen, established a travel fund at Point Park in memory of their late husband and father, John E. Fallon Jr. The fund helps School of Communication and Honors Program students in need travel nationally and abroad to complement their Point Park education. "History and Honors Programs Host Korean War Veterans Storytelling Session," Point Park University website, March 25, 2019. "Helen Fallon Brings More Than 20 Years of Experience to Journalism Program," Point Park University website, Aug. 12, 2015. "International Media Class Travels to Spain and Portugal," Point Park University website, June 24, 2015. "Professor and Students Attend Honors Conference," Point Park University website, May 11, 2015. "Apprenticeship Brings High School Students to Campus," Point Park University website, May 1, 2014. "Honors Students and Professor Plan Annual Conference, Present Work," Point Park University website, April 16, 2014. "Honors Students Attend National Conference," Point Park University website, Nov. 26, 2014. "School of Communication Students Travel Abroad to Study Media Landscape in Germany," Point Park University website, June 28, 2013. "Students Examine Media and Culture During Class Trip to Italy," Point Park University website, June 29, 2012. "Saturday Diary: Mother's Day Without Mom," Pittsburgh Post-Gazette, May 9, 2015. "Business Forum: PA 529 Plans Can Alleviate Future College Costs," Pittsburgh Post-Gazette, Sept. 20, 2014. "Book Review: 'Flight 93': The Heroism over Somerset on 9/11," Pittsburgh Post-Gazette, Sept. 9, 2014. "Saturday Diary: Another Birthday for Lucy (Her 90th)," Pittsburgh Post-Gazette, Oct. 19, 2013. "Saturday Diary: Clairton is a Winner, Whatever the Score," Pittsburgh Post-Gazette, Dec. 15, 2012. "Saturday Diary: Omens of Luck and Loss," Pittsburgh Post-Gazette, March 12, 2012. "Saturday Diary: Rebuilding ... From the Outside In," Pittsburgh Post-Gazette, Sept. 26, 2009.